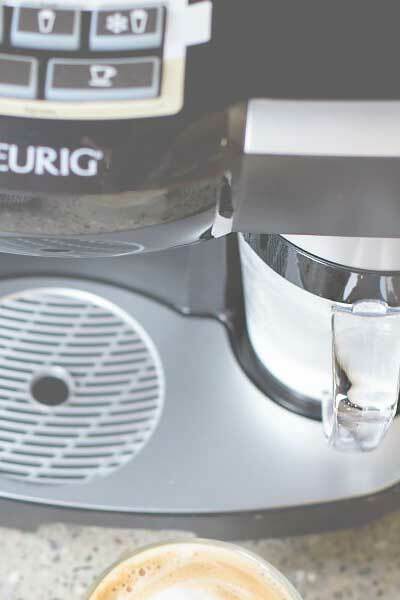 Today we talk about the most common Keurig Rivo problems, along with some solutions for fixing them. If this happened just once or twice don’t worry, this can sometimes happen for no reason. Simply take out the pod from the bin and use it again. Make sure that that the pod bin is empty, that’s important. You can also try this fix: open the handle and push it all the way back, then close it again, to make sure it’s properly aligned and it’s not stuck somewhere. If everything seems fine and your Rivo is still not puncturing the pods, please call Keurig customer service for further instructions. The Rivo brewing temperature is 167 -176 °F, which is slightly lower than optimal temperature. The hot froth is around 150 °F, which is pretty much ideal. When you combine espresso and milk, the final drink temperature will be around 165°F. To make your espresso slightly hotter, run one lungo button without inserting the pod and discard the water. This will heat up the system. You may also rinse your mug with hot water before brewing. This should help keep the coffee hot little longer. With pod espresso machines, some amount of coffee grounds at the bottom is completely normal. They are usually very fine and they don’t mess up the coffee taste or texture. If you’re getting a really messy result or a bad cup of espresso, you might want to call Keurig customer service for assistance. Try this fix: open the handle and push it all the way back, then close it again, to make sure it’s properly aligned and it’s not stuck somewhere. You can also try cleaning the brew nozzle with a paper clip to make sure it’s not clogged with grounds (don’t forget to unplug the machine first), and also try cleaning and descaling your machine. If this doesn’t help, there is a chance that something is wrong with the water hose or the pressure valve in the machine. If that’s the case, I recommend calling Keurig Customer Service at 866-901-2739. Normally, this happens if the milk was below the MIN fill line. When using your Rivo frother, it’s really important to not go below the MIN line and not above the MAX fill line. Check to see if the rubber stopper is all the way up or in contact with the lid. There must be a space between the lid and the stopper, so slide it down a little bit. This should solve the problem. If this doesn’t help, I recommend calling Keurig customer service. Customer service help is available 7 days a week at 866-901-2739. The milk froths but it’s still cold after the cycle is completed? If you use a regular (not cold froth) button, then the milk should always be warm. If that’s not the case, you should call Keurig customer service for assistance. My Keurig Rivo is making a banging noise when I froth milk? According to Keurig, the banging noise is normal during the frothing cycle. If the frother is working properly, then everything is ok. Of course, you can always call Keurig customer service for more information. Sometimes the handle won’t close if the Rivo pack didn’t fit well. You need to lift the handle and adjust the pod. Also, make sure the pod bin is empty and there’s no pod stuck in the machine. You can also try this fix: open the handle and push it all the way back, then close it again, to make sure it’s properly aligned and it’s not stuck somewhere. If everything seems fine, the pod bin is empty, drip tray and the pod looks fine and everything is in the right place but the handle still won’t close, please call Keurig customer service. Simply pull out the drip tray from the machine and the bin will come out together with the drip tray. To keep your machine in a good shape, clean the external parts or the brewer regularly using a damp cloth and descale it every 3,4 months. Here’s a detailed guide on how to clean/ descale your Rivo machine properly. If this doesn’t solve the problem or you don’t see a specific issue listed here, please contact Keurig Customer Service for further assistance. Keurig Customer Service help is available 7 days a week at 866-901-2739. Update: Keurig has discontinued the Rivo platform in December 2016. You can continue to purchase Rivo pods at select retailers, at Keurig .com and Amazon. The company expects the Rivo pods to be available for the next two years. The brewer will also still be supported in case customers need service assistance or replacement parts. In the meantime, they have released a new k-cup machine with a built-in milk frother. While it doesn’t make real espresso like Rivo, it works with all regular k-cups, which are much easier to find than the Rivo pods. So, it’s pretty much like having the Rivo machine with the convenience of using any regular k-cup. When I push the espresso botton (short cycle) lately has been cutting out real quick. Not doing the cycle. The next cup I try it goes way over. Then all lights go on and start rotating. Is the machine done or is there something I can do to reset it. Hi Pamela, please make sure the pod bin is empty and there’s no pod stuck in the machine. You can also try this fix: open the handle and push it all the way back, then close it again, to make sure it’s properly aligned and it’s not stuck somewhere. If everything seems fine, but the handle still won’t stay down, please call Keurig customer service. You are welcome! Thank you for stopping by and let me know if you need anything else. My Rivo constantly alarms.It may happen when you turn it on, when you brew the espresso, or use the froth machine. Even if you unplug it to get it to run again, it alarms at some point and will not work. this is normal as long it’s not happening too often. But if this happens every 3,4 cups, I recommend calling Keurig Customer Service at 866-901-2739.
please call Keurig customer service at 866-901-2739 so they can troubleshoot your machine. All five buttons should blink and work, so there’s a big chance it’s broken. Mine won’t open all the way to release the used pod and allow me to put a new pod in! I can’t reach the pod inside and I can’t get to it from underneath. Anyone else have this issue? How do I fix?? Hi Maria, you need to remove and empty the Pod bin. Next, carefully jiggle the pod with your fingers or a knife to release it. Try releasing the pod from the top and bottom – the pod should fall down. Please make sure you unplug the brewer first and be careful because there are sharp needles inside. I hope this helps. So frustrating! I’m having the same problem and can’t get an answer anywhere. Need to find out why it doesn’t puncture pods & the lid pop up??? Hi Roy, make sure the pod bin is empty, a full bin can sometimes cause this. Next, you can try this fix (one of our readers shared this tip and it really helps: Push the handle ALL the way back – even beyond the point of the initial tension when you would normally stop. What happened is the handle is not applying enough pressure to the pod to make it punctured on both the top and bottom side. Again push the handle all the way back (may seem like you are going to break it, but you won’t). This will reset the handle in the correct place and the next time you put your new pod in the problem should be fixed. If this doesn’t help, I recommend calling Keurig customer service at 866-901-2739. Thank you!!! I thought mine was goner. This fixed it. You are very welcome, I am glad I could help! Hi. I lost the black tube that steams the milk in the milk frother pitcher. Can I replace this part only? The whisk and pitcher and lid are fine. Hi Randi, I don’t think it’s sold separately. They have replacement frother vessel with the lid for $17.95 at keurig .com . Of course, you can call Keurig Customer service at 866-901-2739 and see if they can send that part only. Their customer service is usually really good. After I froth the milk with my Rivo, the milk is still cold. Hi Eddie, if you use a regular (not cold froth) button, then the milk should always be warm. Since that’s not the case, you should call Keurig customer service at 866-901-2739 so they can help and troubleshoot your machine. Their customer service is usually very good and I’m pretty sure they can help. Please let me know how it went. I’m sorry that you’re having issues with your machine Carmen. It is possible that the machine got clogged or there is some problem with the valve inside. I recommend calling Keurig customer service at 866-901-2739. One of my pods fell behind where it is supposed to go and is now stuck in the machine. Is there anyway to get it out? please check the used pod bin and try removing the pod from the bottom. First, unplug the machine, then take out the bin and check both top and bottom side of the pod opening. Try pulling it or losing it out with light pressure. There are needles inside so please don’t use your fingers, but some tool like a paper clip or a knife. My Rivo is acting weird. While brewing the water is going down into reservoir instead of out into the cup. Help?! Hi, Jennifer, I am sorry that you’re having problems with your machine. It’s possible that the machine got clogged and it to be descaled. Also, Rivo can sometimes have problems with the valve inside, that might also be the problem. I am not sure if descaling will work in this case since the water is not coming out. If you’d like to check out the valve and try fixing it on your own, here’s a useful video I found on YouTube. You need to remove and clean out the valve, check out the hoses for any leaks and put everything back. I also recommend descaling your machine after this to remove any calcium deposits. Here’s how to clean and descale your Rivo machine. This should solve the problem. If you’re not much of a DIY person, I recommend to Keurig Customer Service at 866-901-2739 to see if they can help and fix the machine for you, especially if it’s still under warranty. Push the handle ALL the way back – even beyond the point of the initial tension when you would normally stop. What happened is the handle is not applying enough pressure to the pod to make it punctured on both the top and bottom side. Again push the handle all the way back (may seem like you are going to break it, but you won’t). This will reset the handle in the correct place and the next time you put your new pod in the problem should be fixed. Omfg that worked!!! I thought I was going to have to toss my machine and now, omg I am so happy!!! This machine literally is life! !